Founded in 1980, the Museum of Chinese in America (MOCA) is dedicated to preserving and presenting the history, heritage, culture and diverse experiences of people of Chinese descent in the United States. The greatly expanded MOCA at 215 Centre Street is a national home for the precious narratives of diverse Chinese American communities, and strives to be a model among interactive museums. The Museum promotes dialogue and understanding among people of all cultural backgrounds, bringing 160 years of Chinese American history to vivid life through its innovative exhibitions, educational and cultural programs. MOCA welcomes diverse visitors and participants to its broad array of exhibits and programs. MOCA’s expansion accommodates its range of visitors which include: New Yorkers, domestic and international visitors, neighborhood residents, students and school groups from local and regional schools. Central to its mission is its goal to make Chinese American history accessible to the general public, ranging from scholars to young children, from community members to international tourists. Through its thought-provoking work, the Museum not only encourages the understanding and appreciation of Chinese American arts, culture and history, but also informs, educates and engages visitors about Chinese American history that is in the making. With the opening of the new MOCA, the Museum continues to encourage dialogue among its visitors that will transcend generational, geographical and cultural boundaries. MOCA continues to be a platform for cultural dialogue: a self-renewing exchange that brings to life the multiple journeys, memories and contributions of the past and present, woven into a collective narrative that shapes the future of our Chinese American legacy. Through these initiatives, MOCA hopes to increase the visibility of the myriad voices and identities that make up Chinese American history, while increasing local and global dialogue. By understanding and documenting what is happening today, we strive to shape tomorrow. Freed from space limitations, with a dramatic new design, compelling exhibitions and expanded programming, MOCA is now a world-class facility that serves local, regional and global visitors, providing a space for people to learn, share and explore or contribute to the evolving story of Chinese in America. On-site, audiences have access to fresh, innovative exhibits and culturally rich programs, including a core exhibition featuring 160 years of Chinese American history, interactive educational opportunities for families, children and school groups. The Museum’s previous gallery space on 70 Mulberry Street is retained and transformed as an archival centre and serves as a research centre open to anyone with a desire to learn or research Chinese American history. Online, the general public, students, educators, and scholars alike can find a host of features, such as Web-based versions of gallery exhibitions (including the core exhibit, The Chinese American Experience); and a comprehensive, interactive timeline of Chinese American history; downloadable resources on topics such as immigration and diversity will become available. MOCA’s core exhibition, rotating and touring exhibitions, educational services and public programs draw from the collections. The collections are comprised of more than 60,000 letters and documents, business and organizational records, oral histories, clothing and textiles, photographs and precious artifacts – an important assemblage of materials documenting Chinese American history outside of a university. Scholars, writers, filmmakers, students, the media and the general public can consult this unique resource. Today, MOCA’s diverse professional constituency includes educators, scholars and journalists, as well as artists such as designers, photographers, playwrights, filmmakers, actors and musicians who help conceptualize, implement and participate in exhibits and programs. Through the Museum’s initiatives and caliber of work, Chinese American arts, culture and history are shared with pride and celebrated by all. The Museum began as a community-based organization founded in 1980 as the New York Chinatown History Project by historian John Kuo Wei Tchen and community resident/activist Charles Lai. It was created to develop a better understanding of our Chinese American history and community and to respond to the concern that the memories and experiences of aging older generations would perish without oral history, photo documentation, research and collecting efforts. 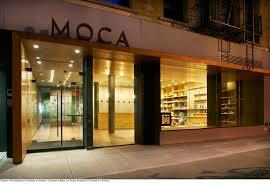 Through the years, MOCA has developed into a trusted community anchor and educational resource. N, R, Q, J, Z, and 6 trains to Canal Street; M9, M15, M103 buses. From Brooklyn: Follow the Brooklyn Bridge, which becomes Centre St. MOCA will be on the left. From The Bronx: Follow the FDR Drive and take exit 5 to E. Houston St. Turn left at Bowery and right at Canal St before turning right at Centre St. MOCA will be on the left. From Queens: Take the ramp onto I-278 W towards the Brooklyn/Queens Expressway. Turn slight left at Delancey St, turn left at Bowery and right at Canal St before turning right at Centre St. MOCA will be on the left. From Staten Island: Take the Brooklyn/Queens Expressway and take exit 28B to merge onto the Brooklyn Bridge. The Bridge becomes Centre St and MOCA will be on the left.